AJ Burnett is one of the games premier starting pitchers with a power fastball and mesmerizing 12-6 curveball he continuously baffles hitters with his stuff. Burnett signed with the New York Yankees during the 2008-2009 offseason with an 87-76 record and 3.80 ERA. AJ Burnett helped the Yankees get back to World Series glory in 2009 and pitched a critical game 2 in the World Series going 7 innings and striking out 9 in a 3-1 Yankees victory that evened the series at 1-1. 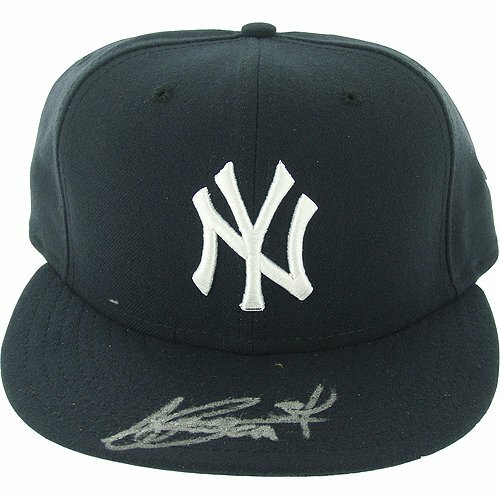 AJ Burnett has hand signed this authentic Yankees on field hat which comes complete with a Steiner Sports Certificate of Authenticity.